Lay the bacon strips on a cutting board and place a piece of tuna in the center of each; season with salt and pepper. Fold the bacon around the tuna and secure with toothpicks. In a large nonstick skillet, heat 1 tablespoon of the olive oil until shimmering. Add the tuna and cook over moderately high heat, turning once, until the bacon is crisp and the tuna is still pink inside, about 6 minutes. Meanwhile, in a medium bowl, whisk the remaining 2 tablespoons of olive oil with the vinegar; season with salt and pepper. Toss in the frisée and avocados and transfer to plates. Remove the toothpicks from the tuna and cut each piece in half. 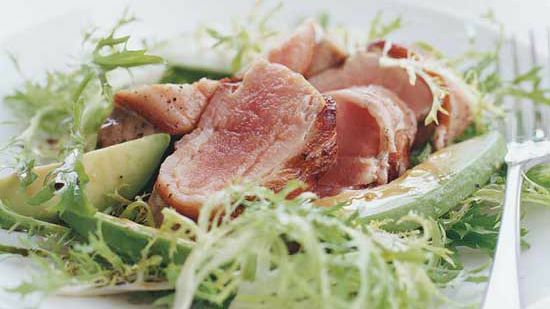 Arrange the tuna over the frisée and serve right away, drizzling any remaining dressing left in the bowl over the fish.